Don’t miss the Creative Cairngorms exhibition! Last night I was at the preview of the Creative Cairngorms exhibition at the Moray Art Centre at Findhorn. If you’re in the Moray area, I would recommend having a wee look. I’ve mentioned before that this is a lovely gallery space and it’s always great to see the breadth of work that the Creative Cairngorms group produces. As well as paintings, there’s photography, jewellery, glasswork, pottery, collage and screenprints: definitely something for everyone. My contribution includes some of my fishy portraits. The show is on until the end of the month so there’s plenty of time to visit! Here’s a few pictures of my work on the walls but there’s a few more snaps on the Creative Cairngorms Facebook page. Angus with his pike painting at the Creative Cairngorms exhibition, Moray Art Centre. Categories: Exhibitions, Painting | Tags: Creative Cairngorms, Findhorn, fish, Moray, Moray Art Centre, pike, portrait | Permalink. I caught the most beautiful trout today. I went to Loch Morlich early this morning (early for a Sunday anyway). It was a break from DIY in the shed and the chance to do a little fishing. The loch and the beach were quiet and there were a just few fishermen camping at the far end. Jane went for a walk with Sparky the dog and left me to it. But it wasn’t all relaxation, honest. Paddling on the kayak gave me a chance to plan my next project. And I’ll admit that catching a few fish has also helped. You know that fishing is a passion of mine and now I’m thinking about making the fish the heroes of the paintings, not just the shapes in the shadows. Something like fishy portraits. Today was a chance to get up close and personal with them – I got three trout and a couple of pike. Not that you’d really want to get too close to them. Too many sharp teeth! But back to that beautiful trout. You’ll see it on the picture below but it had a lovely golden belly. Seems a shame to eat it, but we will. Sparky made friends with it too, as you can see. 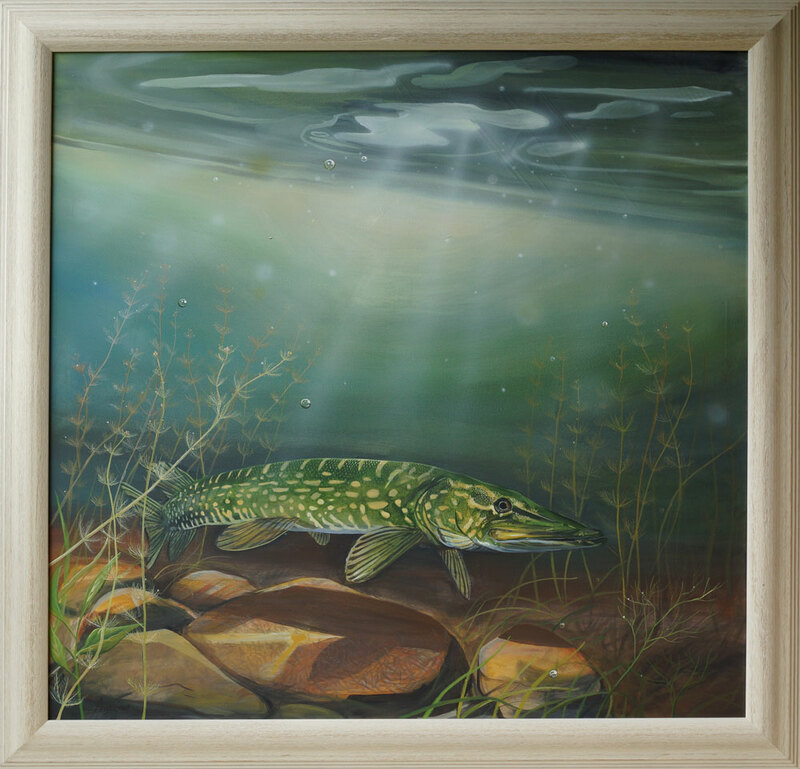 Categories: Drawing, Painting | Tags: fishing, Loch Morlich, pike, trout | Permalink. Here’s a couple of recently finished pictures for the exhibition. The print was made with the help of John McNaught at the Highand Print Studio in Inverness and the painting was made in the wee shed. 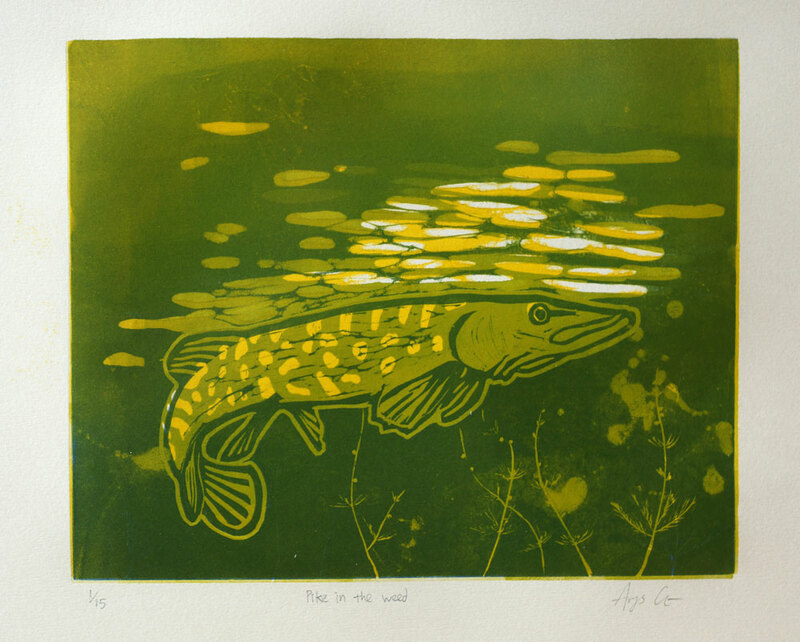 Categories: Exhibitions, Printing | Tags: Beneath the Surface, fish, linocut, pike, underwater | Permalink. Pikie painting in progress. Getting ready for the exhibition in July. 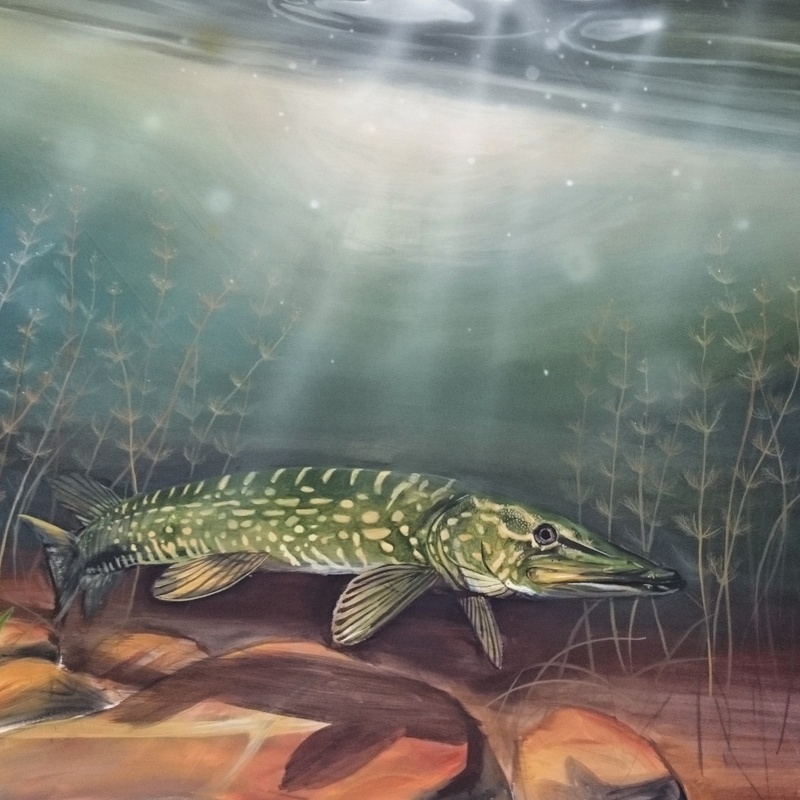 Categories: Exhibitions, Painting | Tags: Beneath the Surface, pike, underwater | Permalink.